​The New Citroën​ C5 Aircross SUV will soon be joining the Citroën​ family. This latest SUV is slightly larger than the C3 Aircross SUV with 720mm diameter wheels and a raised ground clearance of 230mm. It has a unique personality with a strong style displayed in the form of Airbump®​ inspired lower door and wheel arch protectors, roof bars and a broad range of personalisation options. The Citroën​ C5 Aircross stands at 4.50m long making it one of Citroën​'s biggest models and it also boasts a class-leading boot space from 580 litres to 720 litres. The front end design is in line with the rest of Citroën​'s facelift creative with the classic Citroën​ chevrons forming part of the whole front end and moulding into the daytime running lights. A panoramic sunroof adds the the C5 Aircross' style and the high sculpted bonnet and flowing lines highlight its muscular yet not aggressive appearance. ​Inside the C5 Aircross is just as impressive as the outside with a spacious cabin that incorporates generous and flowing shapes while remaining stately and fully functional. At the front of the cabin, the driver's side features a display screen that is a configurable instrument cluster in a 12.3" screen. The centre console is prominent yet not intrusive of space and the interior choice of colours and materials allow your personalisation to shine through. 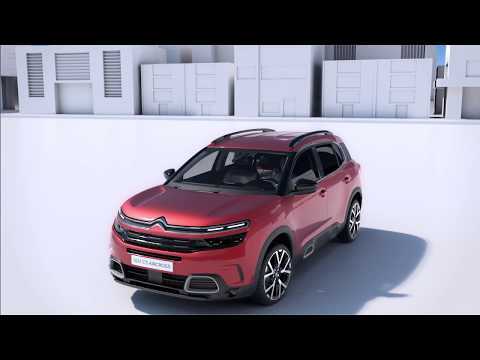 As an ambassador of the Citroën​ Advanced Comfort®​ programme, the New C5 Aircross stands out as the most comfortable SUV in its segment thanks to both Citroën​'s suspension with Hydraulic Cushions®​ and Advanced Comfort Seats. As mentioned, the boot space is rather generous offering 580 litres of space, to 720 litres of space with the incline-adjustable rear folding seats down. As with most of Citroën​'s models, the New C5 Aircross is customisable in up to 30 exterior combinations and 3 interior ambiences. ​The New Citroën​ C5 Aircross is being renowned for its unprecedented levels of comfort for driver and passengers. The Progressive Hydraulic Cushions ®​ suspension system is a marvelous innovation that filters and absorbs major and minor surface unevenness to give all occupants onboard the sensation of flying smoothly over the road. The unique Progressive Hydraulic Cushions® system​ adds two hydraulic stops on either side, one for rebound and the other for compression. When you hit those major uneven surfaces, these stops gradually slow down movement to avoid sudden jolts. When you hit minor areas of unevenness and compression, they absorb them to deliver a 'magic carpet ride' effect. The Advanced Comfort®​ Seats are wide and inspired by the world of furniture. These seats combine high-density foam in the centres and a 15mm thick textured foam surface thus enforcing softness and support at all times. The front seats in the New C5 Aircross are also heated, an extra treat there in the cold UK! With a new Citroën​ model comes some new engine options. The C5 Aircross offers a range of efficient and powerful Euro 6.2 engines with either the 6-speed manual gearbox or the 8-speed automatic gearbox. There are two petrol versions available; PureTech 130 S&S 6-speed manual and the PureTech 180 S&S 8-speed automatic. For diesel options, there is the BlueHDi 130 6-speed manual, the BlueHDi 130 S&S 8-speed automatic or the BlueHDi 180 S&S 8-speed automatic. With the New C5 Aircross, you get the most recent 8-speed automatic gearbox, 8-speed "Efficient Automatic Transmission" with Shift and Park by wire control that offers more efficiency and comfort. It's fuel consumption is up to 7% lower compared to the 6-speed automatic model thanks to the two additional gears. Also, the two additional gears provide smoother gear changes by reducing the intervals between gear changes. Finance offers apply to qualifying new vehicles ordered and delivered between 01/04-30/06/19. Offers available to qualifying retail customers excluding PSA UK Finance UK Contract Hire. 3 years’ 0% APR Conditional Sale with 10% deposit available on C3 (excluding Touch), C3 Aircross SUV (excluding Touch), New C5 Aircross SUV, New Berlingo, C4 Cactus Hatch, C4 SpaceTourer and Grand C4 SpaceTourer. 4 years’ 0% APR Conditional Sale with minimum 20% deposit available on C3 (excluding Touch), C3 Aircross SUV (excluding Touch), New C5 Aircross SUV, New Berlingo, C4 Cactus Hatch, C4 SpaceTourer and Grand C4 SpaceTourer. 3 years’ Elect 3 0% APR available on C1 Flair and Flair Edition and C4 Cactus Hatch. 4 years’ Elect 3 0% APR available on C3 (excluding Touch) and C4 Cactus Hatch. 3 years’ Low Cost Elect 3 2.9% APR available on C1 (excluding Flair and Flair Edition). Finance offers apply to UK Mainland only. All Citroën Elect 3 products quoted with compulsory Citroën Assistance. Finance subject to status. Guarantees may be required. Over 18s only. Elect 3 examples based on 6,000 miles per annum. Excess mileage charges will apply if you exceed the agreed annual mileage. Written quotations available on request from PSA Finance UK Ltd, RH1 1QA. Citroen UK Ltd is acting as a credit broker and is not a lender.